If something is crepuscular, it means that it is dim, indistinct, and not easily visible. A diaphanous cloth is thin enough to see through. A gossamer material is very thin, light, and delicate. You use hermetic to describe something that is set apart, isolated, or separate from the influence or interference of society at large. If you describe speech or writing as limpid, it is clear, simple, and easily understood; if you describe something, such as water or eyes, as limpid you mean that it is clear or transparent. A stygian place is extremely and unpleasantly dark, gloomy, and frightening. The insect’s translucent or partially transparent wings were so delicate. Each translucent or nearly clear wing was dotted with blue and edged in green, whereas the rest of the insect’s body was made of a material that allowed no light to pass through at all. At night, light that shone from the insect’s body glowed right through these translucent or almost see-through wings. Quiz: Try again! What is a translucent substance? It is a source of light that can shine brightly. It is like a white cloud because it allows some light to pass through it. It is a substance that makes up the body of an insect. A translucent object allows some light to pass through it. Ransom Three Billion Cents The ransom for the beautifully clear, translucent diamond was set at three billion cents, as the price of copper per pound had skyrocketed. A translucent material is in the “state or condition” of being able to have “light” shine “through” it. 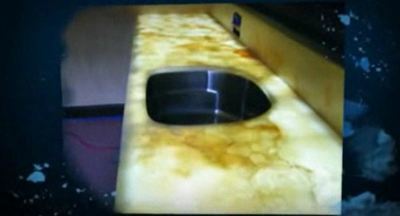 YouTube: Tyler Co. Inc.'s Channel What a translucent kitchen countertop looks like.